Snow. Everybody loves Snow. 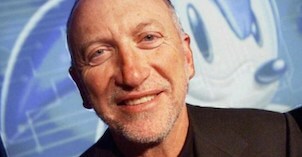 His 1992 hit Informer sat pretty at the top of the US billboard charts for seven weeks, for example, proving that yes - everybody loves Snow. Of course, I jest. I am of course referring to the frozen white stuff, not the Canadian reggae artist from the 1990s. Snow is great fun and if it's not threatening to destroy the planet like in that film with Donnie Darko and Bilbo Baggins in it, it also heralds the coming of winter and Christmas. One of the most useful properties of snow is that it can be scooped up, fashioned into a throwable missile and then launched at someone's face with great force, thus enabling the age-old practice of the snow ball fight. As well as this, people with lots of money can use snowmobiles to race on it. And that's exactly what happens in SnoCross Championship Racing. 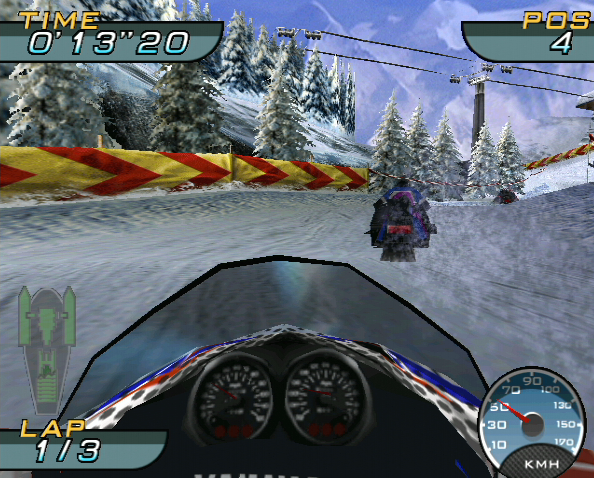 Developed by Unique Development Studios (aka UDS), SnoCross is actually the only title this obscure Swedish studio ever produced for the Dreamcast, having previously worked on No Fear Downhill Mountain Biking for the PlayStation. 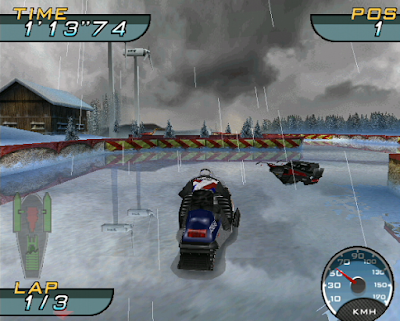 The game was published by Crave Entertainment and Ubisoft in 2000 for the Dreamcast and it sits alone in the racing genre as the only snowmobile racer for Sega's console. That said, it isn't the only game to feature snowmobiles as the D2 Shock demo that shipped with Real Sound: Winds of Regret also features a sort of open world mini-game where the player is tasked with locating various objects in the snow covered wilderness, careening about on a snowmobile. 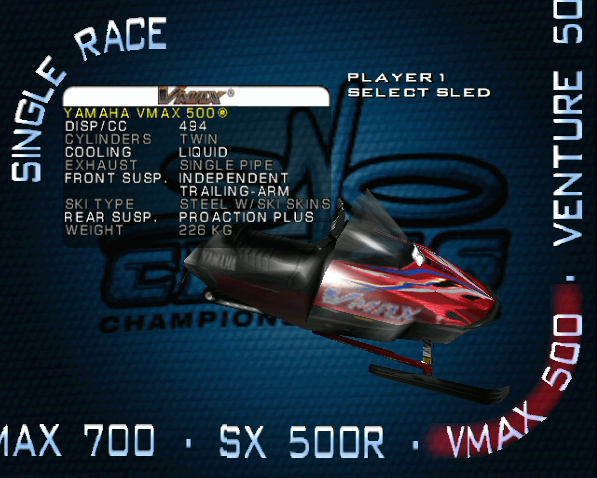 The first thing you notice about SnoCross upon starting the game proper is just how bad it looks. 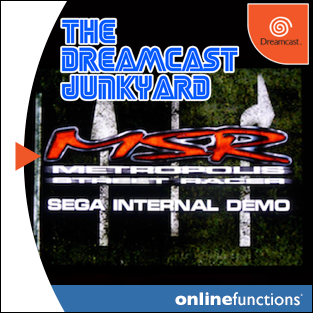 It really does look like a PlayStation game, with boxy riders and badly textured, low detail environments par for the course. There are some nice little visual effects, such as reflective ice sheets and lens flares from the vehicle headlights, but for the most part SnoCross just looks bad. 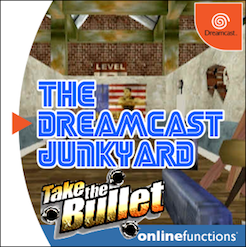 In fact, it's probably one of the worst looking games on the Dreamcast, and easily identifiable as one of those titles that was most probably developed with the original PlayStation in mind, before being slightly upgraded and chucked onto a GD-ROM as an afterthought. That said, where SnoCross makes up for this visual horror show is in the gameplay and options. 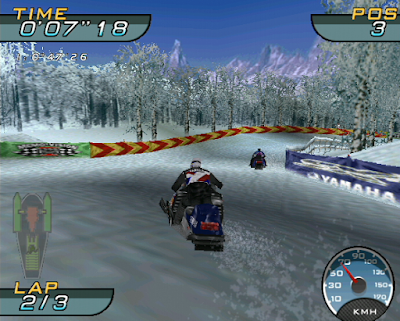 There are the usual quick race and time attack modes to play around with, but the main meat of SnoCross is in the main championship. There are three different tiers of difficulty, all of which are represented by ever increasing snowmobile - or sled - engine capacities. It's a bit like Mario Kart with differing displacements equating to skill level, with 500cc the lowest and easiest and higher ccs used to identify an increase in difficulty. All of the vehicles are officially licensed too, meaning Yamaha logos are abundant. 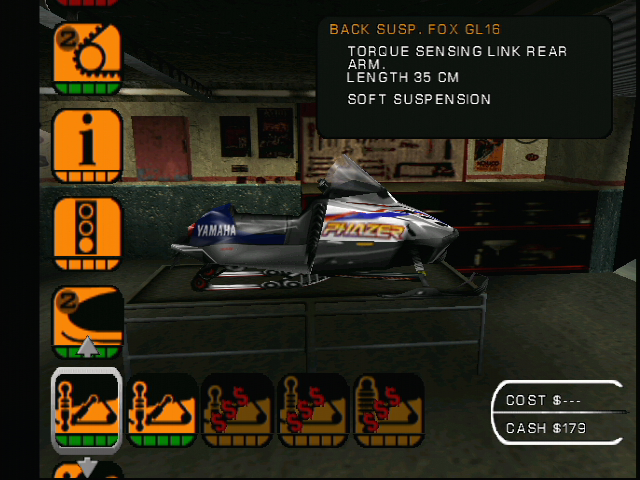 On top of this, the championship does throw in some nice features, such as being able to win cash from races that enable you to buy new parts and upgrades for your sled, and also pay for repairs to various components that get damaged during races. 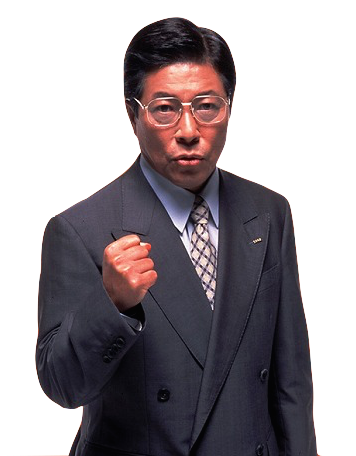 No loot boxes or upgrade cards here, y'all (topical joke - check). The races themselves only have four competitors (including you) so the grid isn't overly packed, and this does seem a bit stingy. 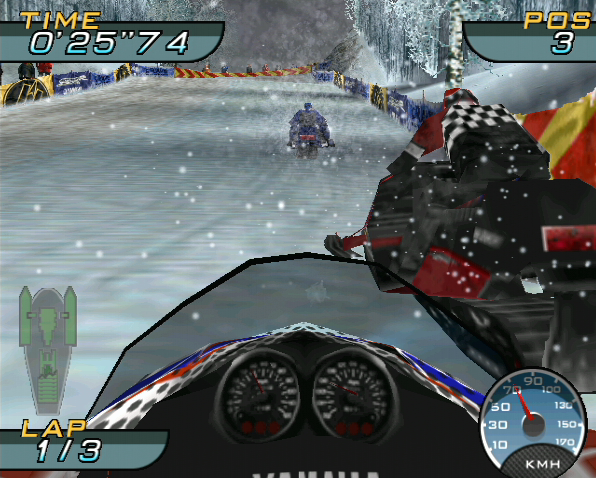 However, once you get to grips with the slightly unorthodox controls SnoCross does actually become quite a fun little game. If you go into SnoCross (as I did) expecting the sleds to handle like cars, then you'll have a torrid time even staying on the track. 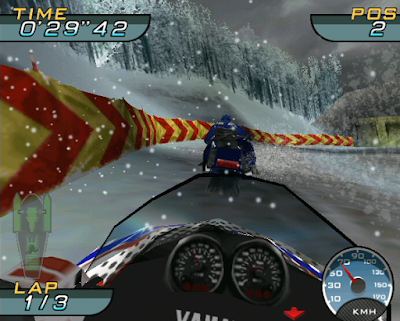 Smashing into walls and having your rider thrown from the saddle is a regular occurrence initially, and this also happens to the AI riders you're racing against. 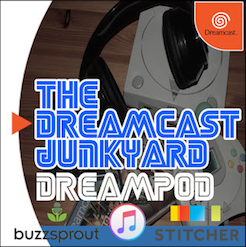 At first, I wasn't sure if this was just down to appalling AI or what, but it seems that the inclusion of error-making competitors adds something to the experience and gives the impression you aren't just racing against mindless drones. 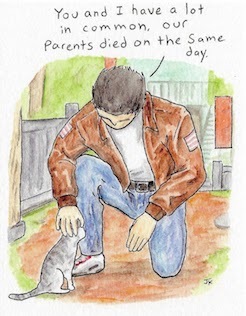 Or maybe that's just me being overly kind to the game. 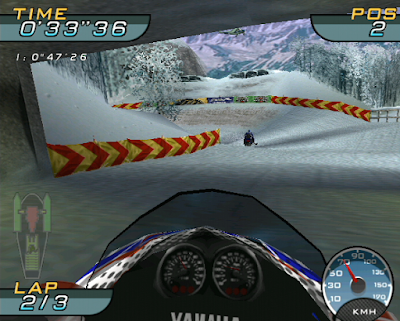 Once you learn the nuances and appreciate that these are snowmobiles and not rally cars, then it actually becomes quite intuitive to guide your sled through tight channels and through the trees. Sliding around corners with liberal application of throttle is the order of the day here, and once you train yourself to forget everything you thought you knew about vehicle handling in conventional racers then the events in SnoCross become very intense and actually pretty heated...even with all the snow and ice and stuff. Oddly, there is no support for the rumble pack but you really can feel the difference in the way the sleds control when thundering over pack ice, or a muddy patch or even over a frozen lake. 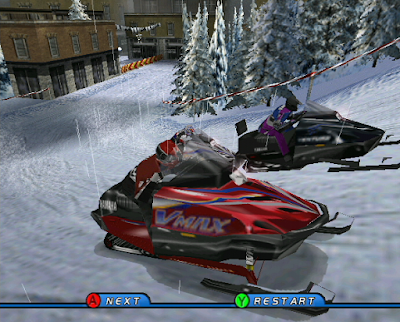 The way the sleds behave and grip different surfaces is well conveyed and certainly wasn't something I was expecting from a game that looks as bad as SnoCross does. 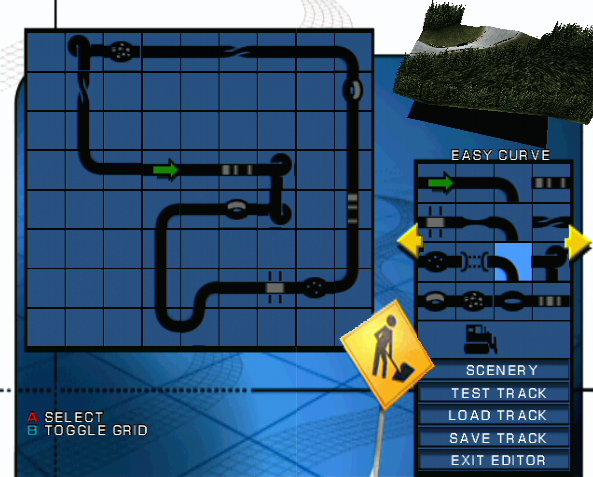 The track design isn't really that inspired - most of the ten circuits are pretty indiscriminate and feature the usual selection of villages, jumps and bridges. As mentioned, a couple of them feature frozen lakes and there are some nice incidental background details such as planes arcing across the sky; while the more severe weather conditions and day/night settings can add a bit of drama to proceedings. 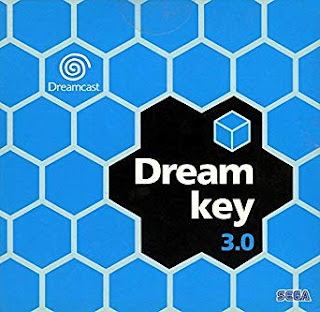 However, even though they range in geographical location from Japan to the USA to Europe, most of them look and feel pretty similar in design. 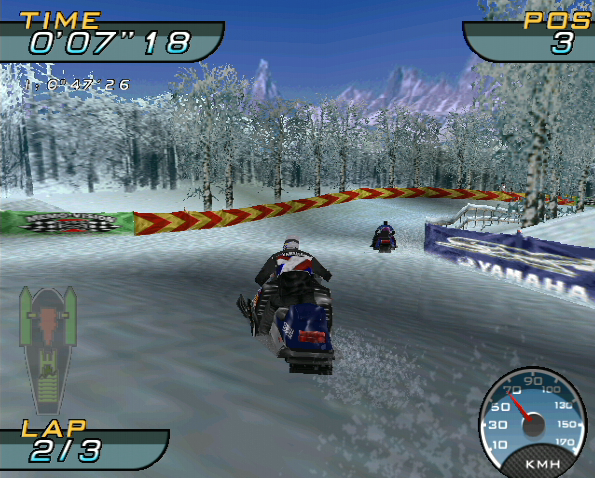 The one trump card SnoCross offers though, is the create a track feature. 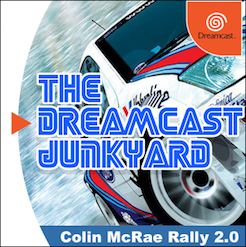 This essentially offers the player an infinite number of tracks, and the editor is incredibly easy to use. Like the track editor in V-Rally 2, the one here is restricted by the size of grid offered and there are only two different visual styles when it comes to environment, but the inclusion of such a feature is commendable. SnoCross is a pretty substandard title when it comes to both visuals and sound (the engine sound is just one 3 second sample repeated over and over; while the music is as forgettable as it comes), but in truth these aesthetic problems can almost be overlooked simply because SnoCross is really good fun to play. It's certainly no looker, but if you find it cheap then SnoCross is worth investigation if you're looking for a different take on the racing genre. What do you think? 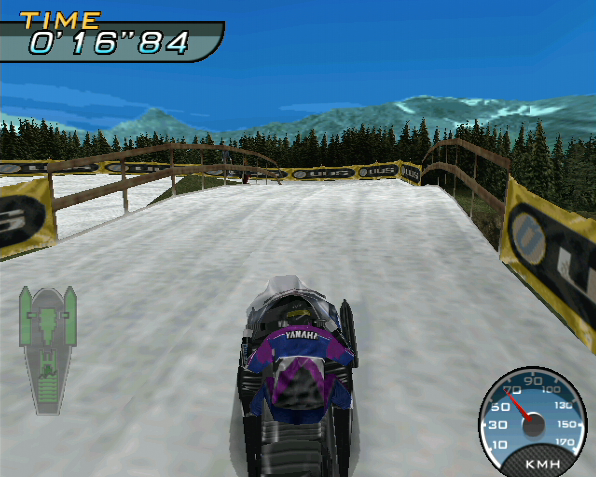 Have you played SnoCross and if so, how do you find it? 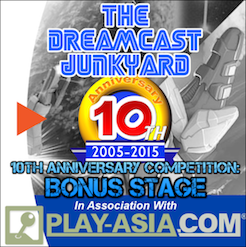 Let us know in the comments, or join the conversation in our Facebook group or on Twitter. As I'm a bit of a winter-sports nerd, I really wanted to like the game, but found it a bit too generic and a bit too hard on the eyes to enjoy properly. I found switching to first person view to be a major help though, and it improved the frame rate issues a fair bit. Good review as always Tom! Tom, what AV output were you using? 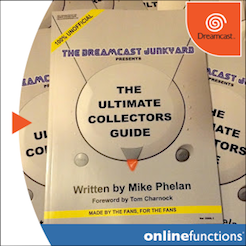 The PAL version needs a patch for VGA compatibility, or the av/vga boot trick. 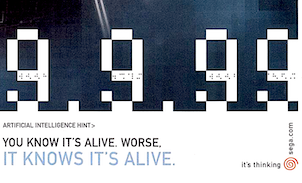 There isn't a widescreen code found yet, that might help as well. Maybe rumble could be enabled with a cheat code or some hex editing to the game too. 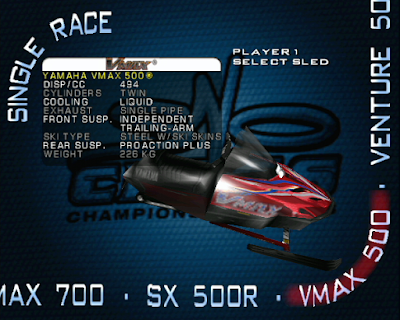 There was an officially licensed Yamaha power sport controller for PS2. 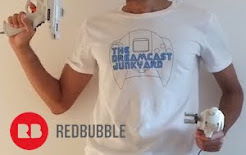 With an adapter, and if the button mappings were right it would be a cool add on to the game. 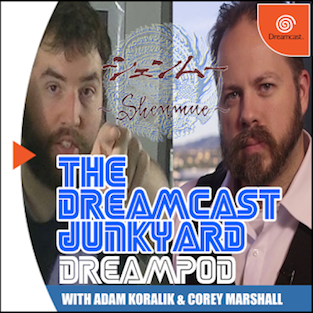 I used the Akura HDMI adapter which essentially takes the VGA output from the Dreamcast. 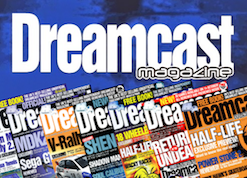 That said, I was using the modded Dreamcast that loads GDs through DreamShell so maybe the VGA was forced through that? 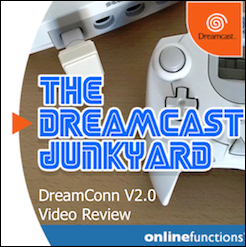 Is The Dreamcast Controller Really That Bad?